Comet Cable Glands are available in Vadodara, Ankleshwar, Halol, Surat, Bharuch, Surat, Ahmedabad, Rajkot, Gandhidham, Mehsana and other cities of Gujarat. Mahendra Electricals is the Authorized dealer for Comet Cable Glands and Lugs for Gujarat State. For technical data of cable glands you can google us or find it on our website. Lugs Cable Lugs offeredcomes supported by quality design and construction standards so as to provide in these lugs and terminals high quality finish and lasting performance. Further, these comes developed using advanced injection molding process so as to achieve high precision construction finish. Some of its features include high working frequency, suitable for use in motorcycle, automobile and other vehicles, durable and lasting construction finish and also available in OEM construction options. We are leading supplier Vadodara, Bharuch , Godhra , Ahmadabad Gujarat. Comet Weatherproof Cable Glands should be always bought with PVC Shroud for protection under varied climatic conditions. Mahendra Electricals is the authorised distributor of Comet Cable Glands and Lugs in Gujarat. We have clients in Vadodara, Ahmedabad, Bharuch, Ankleshwar, Rajkot, Gandhidham, Mundra, Surat and different cities in Gujarat. Comet Copper Tubular Terminals - Widely used series for soldering or solder less crimping application made from L & Cu. Standards followed are IS, BS & DIN. Available at Mahendra Electricals, Vadodara. We supply Comet Cable Glands and Lugs in Vadodara, Ahmedabad, Surat, Ankleshwar, Bharuch and other cities of Gujarat. Cable Binding Ties manufactured by Hoods Corporation, Kolkata, West Bengal. 300 x 3.6 Black Cable tie Available in white and black colors at Mahendra Electricals, Vadodara, Gujarat. For inquiries of Comet Cable Gland, Cable lugs and crimping tools, email us. Mahendra Electricals is industrial supply house supplying in GIDC Makarpura, GIDC Por, GIDC Waghodia, GIDC Manjusar, GIDC Savli and in Ahmedabad, Gandhinagar, Jamnagar, Ankleshwar, Bharuch, Vapi and other cities of Gujarat. Cable Binding Ties manufactured by Hoods Corporation, Kolkata, West Bengal. 100 x 2.0 White Cable tie Available in white and black colors at Mahendra Electricals, Vadodara, Gujarat. For inquiries of Comet Cable Gland, Cable lugs and crimping tools, email us. Mahendra Electricals is industrial supply house supplying in GIDC Makarpura, GIDC Por, GIDC Waghodia, GIDC Manjusar, GIDC Savli and in Ahmedabad, Gandhinagar, Jamnagar, Ankleshwar, Bharuch, Vapi and other cities of Gujarat. The Standard nylon cable ties may be affected by explosure to ultra-violet(UV) light i.e from direct and indirect sun light.UV exposure eventually result in material oxidation, diminishing the mechanical performance characteristic of cable tie. Hoods Ultra violet (UV) cable ties are available at Mahendra Electricals. We have client base across the country and we give next day delivery in Ahmedabad, Ankleshwar, Bharuch, Jamnagar, Mundra, Dahej, Rajkot and other cities across Gujarat. Mahendra Electricals is the authorized distributor of Comet Make Cable Glands for the state of Gujarat. 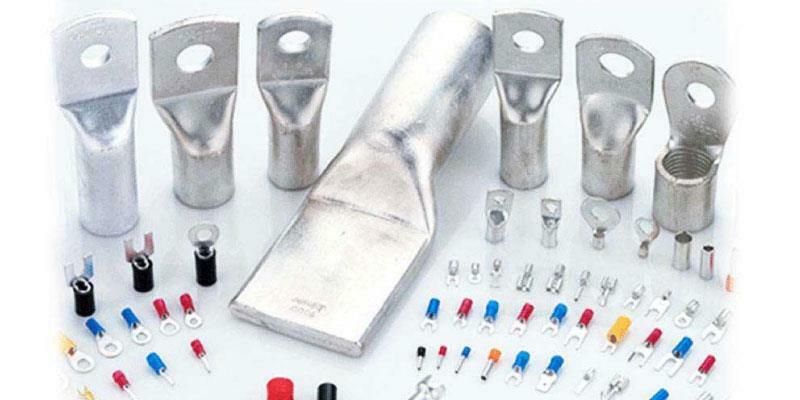 Comet Lugs Aluminium Tubular Terminal Series Sizes available from 2.5, 4, 6, 10, 16, 25, 35, 50, 70, 95, 120, 150, 185, 240, 300, 400, 500, 630, 800 and 1000 sq.mm. in tubular, long barrel, inline and reducer pin terminals. Authorized Dealer: Mahendra Electricals Comet Cable Glands are available in Vadodara, Ankleshwar, Halol, Surat, Bharuch, Surat, Ahmedabad, Rajkot, Gandhidham, Mehsana and other cities of Gujarat.